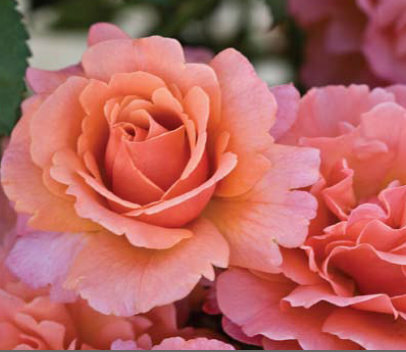 Easy Does It — hybridized by England’s Harkness New Roses and introduced by Weeks Roses of Wasco, in Southern California — is the sole AARS winner for 2010. It’s the first time since Pleasure was introduced in 1990 that a single rose has been named best of the best. Harkness also bred Livin’ Easy, an AARS selection in 1996. The rose is a floribunda, which means it bears numerous single or clustered flowers. The extravagant double-ruffled blooms, blending hues of mango, peach and apricot, are said to have a mildly fruity fragrance. “The colors are intense, and it has a beautiful habit, full and lush,” says Tom Carruth, who knows a few things about roses. He’s the legendary Southern California hybridizer and current president of AARS who is the winner of more AARS awards than anyone in the world. The local bed with the soon-to-be-famous plants has just started blooming. Carruth, who will be in San Jose today to help introduce the rose, says we have a big show to look forward to.